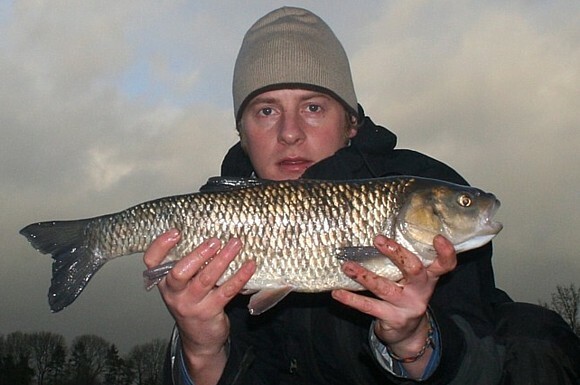 When the rivers are up in flood, you have a great chance of locating the bigger chub. First of all you need to find a slack bit of water just off the main flow. With any luck, the fish will be tucked up in such a swim out of the way of the strong flood currents.These are also the sort of spots on the river into which the natural food flows in. I find the best way to attract Chub is to use a smelly bait, for example Nash Monster Barbel bell shaped boilies. Not only do the Chub seem to love them, but they are easy to use with a bait band. Of course other baits like lobworm, meat and bread are also great baits to use. I like to use a medium weight feeder rod with 5lb main line and a 3-4lb hook link as there is always a chance of the fish swimming in to the main flow. Plus the river also has a good head of Barbel! Keep the rig simple like the one above and try and use the lightest weight you can get away with. This Chub was the best of a five-fish haul on a very dark and stormy day with the river almost level with the banks. A nice little slack section and the very rig and bait described above was all that was needed. And a little patience of course!